Bread has had a spiritual significance throughout the ages, and is a potent symbol of the harvest. 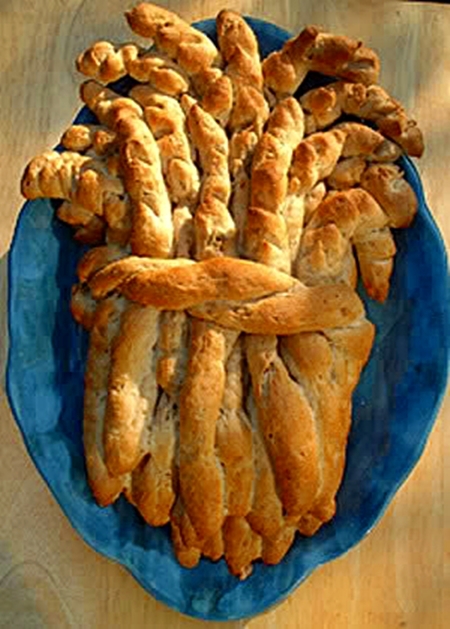 In the Anglican (Episcopalian) church, for instance, a pretty harvest bread such as this one might be part of the "Harvest Home" service. It certainly makes a lovely centerpiece for a Thanksgiving celebration. This recipe makes two, so you can keep one for the centerpiece and eat one! This bread is not only nutritious and delicious, but it also makes a spectacular centerpiece! It's not hard to make-- honestly! This can be made ahead and frozen, well wrapped. You can shape the dough as I have suggested, or do it your own way and get creative! Scald the soymilk (you can do this in the microwave, in a Pyrex measuring beaker or glass bowl, for 1 minute on 100% power) and then add the vegan buttery spread or oil, syrup, salt, and bulgur wheat, mixing it in a large bowl or the bowl of your stand mixer with a dough hook attachment. Allow this to cool to lukewarm. Meanwhile, dissolve yeast in the warm water in a cup until bubbly. Add the dissolved yeast, walnuts, and the whole wheat flour to the milk-bulgur-etc. mixture. Beat until smooth. Add the wheat germ, and then add unbleached flour to make a knead-able dough (it can be a little sticky—that’s better than too dry). 1.) If kneading by hand: Turn out the dough onto a large square of baking parchment and let it rest (covered by a clean damp towel) while you clean the bowl. Knead vigorously, adding a little more white flour as necessary, but use as little as possible to avoid making an overly-stiff dough, for about 10 minutes, until you have a smooth, elastic and relatively non-sticky, but moist, dough. Oil the bowl and return the dough to it. Cover and let rise in a warm place until doubled in bulk, about 1 1/2 to 2 hours. 2.) If kneading by stand-mixer with dough hook: Add unbleached flour until the dough pulls cleanly away from the sides of the bowl while it kneads. Knead for 8-10 minutes. Turn the machine off. If your bowl is big enough (a Bosch, for instance), you can just place the cover over it and let it rise in the same bowl. If there is not room for it to rise, place it in a larger oiled bowl, cover and let rise in a warm place until doubled, about 1 1/2 to 2 hours. 3. )You mix and knead and rise the dough in an automatic bread machine according to your machine's directions(use the Dough Cycle), but you’ll have to use only half the recipe. 4.) You can also make the dough in a food processor, but again, unless you have a large processor, you’ll have to make only half the recipe, or do it in two batches. After the dough forms a ball on the blade, process for 30 seconds. Place the dough in an oiled bowl (with room to double), cover and let rise in a warm place until doubled, about 1 1/2 to 2 hours. Punch the dough down and divide it in half . Keep the half you are not working with covered with a damp cloth or a plastic bag while you work on the other half. Avoid handling the dough too much prior to rolling it out— that may make it tough and hard to handle. If this happens, just cover it and let it rest for 10 minutes or so to “relax” the gluten. 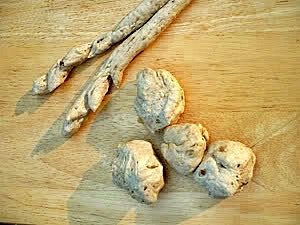 Dough rolling technique: I use an unfloured kitchen counter top and form the ball of dough into a rough sort of cigar-shape. Then a I roll with splayed fingers from the middle outwards. If the dough breaks, just pinch it back together. If one end is thicker than the other, gently hold the middle of the rope down with the splayed fingers of one hand and roll the thicker end with the splayed fingers of the other. To make one loaf, turn one half of the dough out onto a large working surface sprinkled with flour. Divide into 18 equal pieces. Roll two pieces into 12” long ropes. (I use a small retractable carpenter’s measuring tape for measuring .) Twist the two ropes together (starting in the center) and set them aside, covered by a damp tea towel or plastic wrap. Roll 4 pieces into 18” ropes. Place one 18” rope lengthwise on the center of a greased baking sheet, which has been sprinkled with cornmeal, bending the top third of the rope off to the left at a 45 degree angle. Place the other 18” rope on the sheet next to and touching the first rope, but bend the top third off to the right. Repeat this using the other two 18” ropes, placing them so that they are touching. Roll the remaining dough (from the half you are working with) into 15” ropes. Arrange them on top of and around the 18” ropes. Spread out the ropes a little at the bottom to form the base of the “sheaf”. Drape the twisted 12” ropes around the center of the loaf by “tying” the sheaf together, tucking the ends under gently on either side. Cover loosely with a large plastic bag and let the dough rise again for about 40 minutes, or until doubled. Turn the baking sheet so that the top section faces you. On each rope (or “stalk”), use kitchen shears or scissors to snip the dough above the “tied” part of the “sheaf” and give it the appearance of wheat. Snip 2/3 of the way through the dough at a 45 degree angle to the top of the dough. Repeat at 1/2” intervals. This will create little pointy shapes that make it look like wheat. Paint the entire surface with the soy or nut milk and bake for 25 minutes. 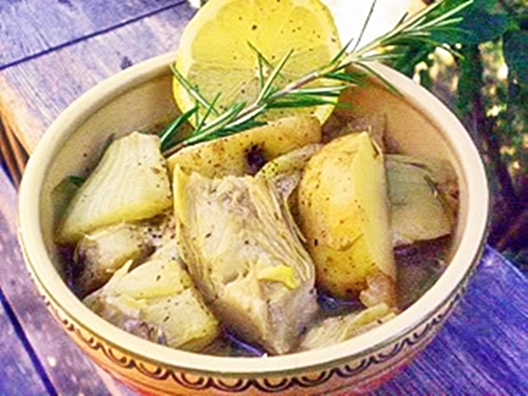 If the ends of the stalks seem to be browning too much, cover them with foil. Remove from the baking sheet, using spatulas, while still warm. Cool on a rack. NOTE: you can make "wheat stalk" breadsticks with this dough, if you like-- bake separated by an inch or two until golden brown, which will only take about 15 minutes. You can stand the "stalks" up in a glass vase. I like to blog twice a week, but it hasn't been happening lately! 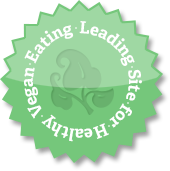 Not only am I testing recipes for the upcoming Vegan Feast newsletter (and I don't like to reveal too much ahead of time and spoil the surprise for subscribers!) 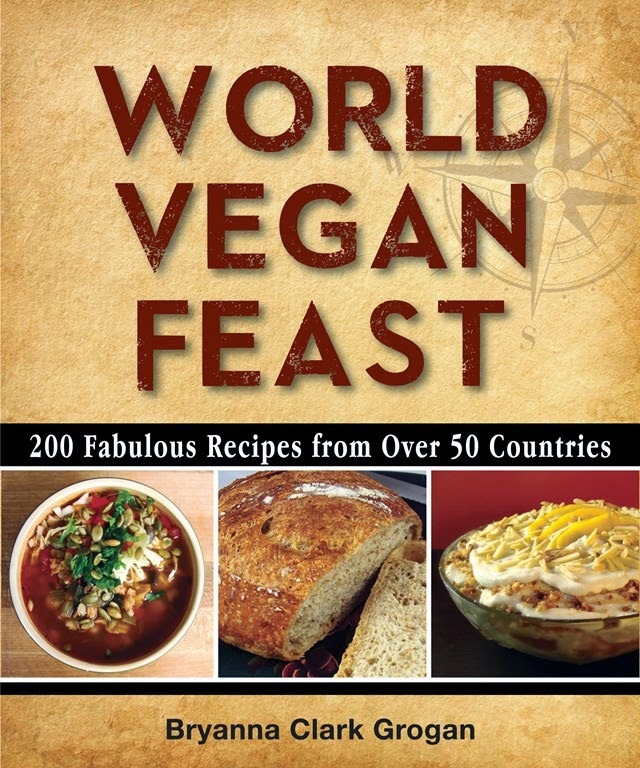 AND a book I'm co-authoring, so that doesn't leave alot of time for blog recipes! The following unusual but delectable "jam" recipe was inspired by one in Sally Schneider's wonderful book "The Improvisational Cook", which was inspired by a recipe from Mario Batali-- "Lemon Oregano Jam". 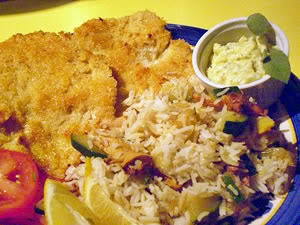 It attracted me right away because I love just about anything lemony, and I thought it would make an unusual accompaniment to a simple dish such as the Japanese dish "Tonkatsu" (crispy, thin, breaded cutlets), an example of "yohshuko", or Japanese-style Western dishes. "...You have a better chance of successful improvisation and creativity if you have a very firm grasp of the basics. 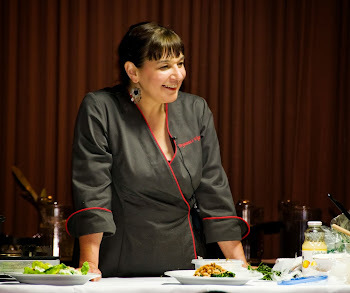 Creativity can be inspired in many ways, a meal in a restaurant, a new cookbook, a trip to the market, etc. But improvisation is a different matter. Improvisation is "a performance given without planning or preparation". So basically you are relying on your brain for inspiration. 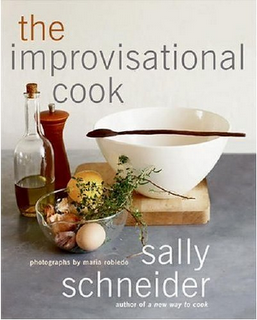 Sally Schneider's new book, The Improvisational Cook is an exploration into the concept of improvisation in the kitchen and provides some wonderful recipes and ideas along the way. Schneider explains how recipes work in a section called "Understanding", and then various riffs on a single recipe. How does it work? Here is an example of an idea and recipe--the author begins with a Lemon Oregano Jam that she first tasted at Mario Batali's restaurant Babbo. She explains that the technique of pureeing the whole lemon is crucial and that the addition of oil helps to round out the flavor and creates an emulsion. In addition to the original recipe, her variations include Lemon Lavender Jam, Tangelo Jam, Tangerinesicle Parfaits, and Meyer Lemon Dessert Sauce and Filling. 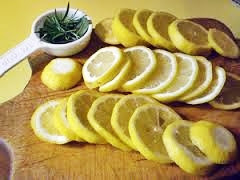 Scrub the lemons with 3 parts water plus 1 part white vinegar, then pat dry with paper towels. Cut each lemon into thin slices and remove and discard the seeds. 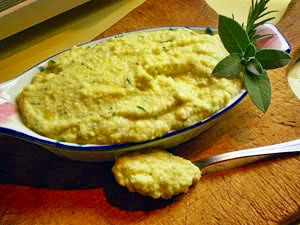 Place the lemon pieces, sugar and salt in a food processor and process to a coarse puree. With the motor running, add the olive oil in a thin stream; the mixture should emulsify, becoming honey-like in consistency. Add the herbs, pulsing to mix. The jam can be prepared up to this stage and kept, refrigerated, for several weeks. Transfer it to a clean glass jar, placing a piece of plastic wrap between the top of the jar and the lid to keep the lid from corroding. Bring to room temperature before serving (it solidifies), stir to re-combine. Nutrition (per 2 Tbs. serving): 56.6 calories; 58% calories from fat; 3.8g total fat; 0.0mg cholesterol; 86.5mg sodium; 45.6mg potassium; 7.8g carbohydrates; 1.4g fiber; 4.5g sugar; 6.4g net carbs; 0.4g protein; 1.2 points. I'm not big on canning or jam-making anymore, but I recently made a small batch of beautiful, tangy Italian plum jam. We have a volunteer plum tree with little tiny plums. This is only the second year that we've had any plums from it. Last year we had lots and I made Chinese plum sauce and plum chutney. This year we only got a few. The racoons, new to Denman Is. in the last few years, got alot of them I think-- at least we chased off two fighting in the tree early one morning! I happened to see a recipe from vegetarian cookbook author Anna Thomas for an Italian jam using tiny plums, so I had the perfect material for this recipe! I think the kind we have are "Hardy Plums". 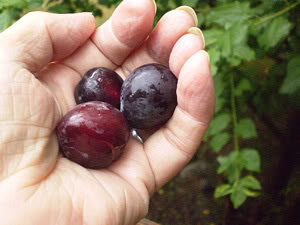 See this page for information on plum varieties. 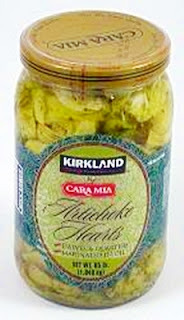 It says: "these are selections of native American species of wild plums, or hybrids between these species. These plums are hardy, late blooming, usually small or very small plums adapted to the rigors of northern continental climates where most of even the more winter hardy European plum are not successful." I changed Ms. Thomas' cooking method a little. My method eliminates the time-consuming task of pitting all those little plums by cooking them whole for a few minutes with the other ingredients, and then running them through a food mill. 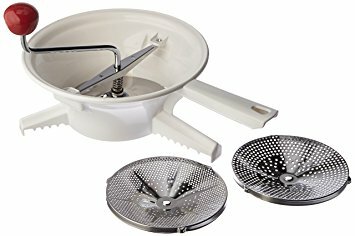 The Food Dictionary at epicurious.com describes a food mill as: "A kitchen utensil that can be best described as a mechanical SIEVE. It has a hand-turned paddle that forces food through a strainer plate at the bottom, thereby removing skin, seeds and fiber. Some food mills come equipped with several interchangeable plates with small, medium and large holes." 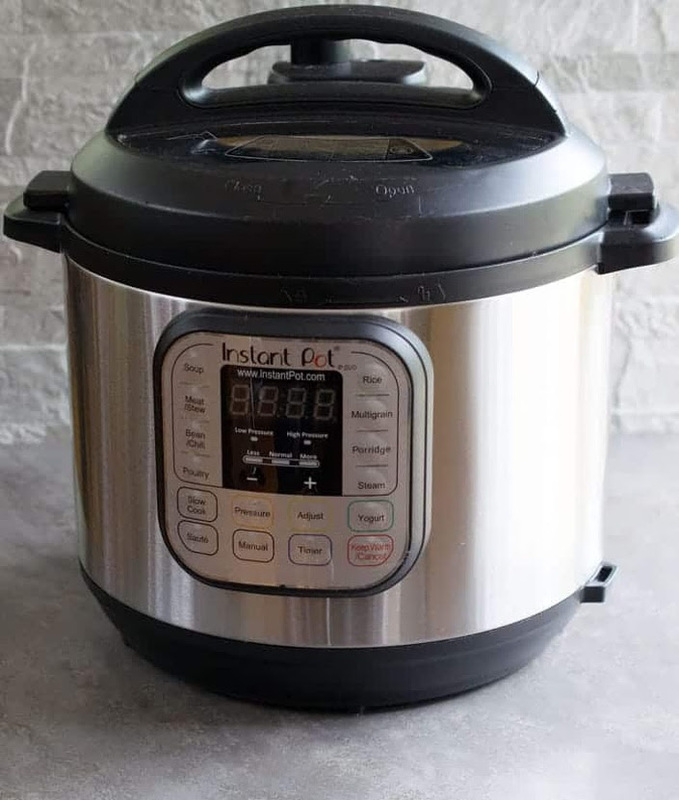 This is the one I have, a 2 qt. capacity model. Kitchen and cookware shops carry them, and they are handy for applesauce, tomato sauce, and many other kitchen tasks. 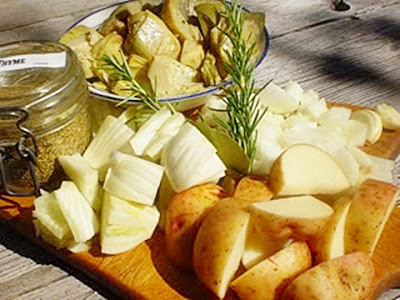 As another vendor states: "This timeless, hand-operated, kitchen tool is a multi-function wonder that removes objectionables, like tiny seeds, skins, fiber and cores from almost any fruit or vegetable." And: "Outstanding for homemade sauces, purees, jams, soups and natural baby foods." Note from Bryanna: My jam was not really thick, but spreadable. 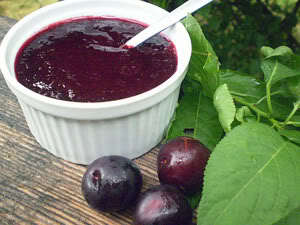 Wash the plums well, and combine them with the sugar and lemon juice in a medium stainless steel pot. Stir slowly over very low heat until the sugar is completely dissolved. Return the strained mixture to the heat and bring to a gently simmer again. Cook about 3 or 4 minutes more. When the fruit seems to be thickening slightly, turn off the heat and put a tablespoon or two of the jam on a small plate, then put the plate in the freezer. After a couple of minutes, check the test batch. If it has a jam-like consistancy, you're done. If it's too runny, boil the jam for a few more minutes and test again. Ladle the jam into clean half-pint jars and keep it in the refrigerator. It should last for a couple of weeks, but it will be eaten before then. Nutrition (per 2 Tbs. ): 75.4 calories; 1% calories from fat; 0.2g total fat; 0.0mg cholesterol; 0.0mg sodium; 94.0mg potassium; 19.3g carbohydrates; 0.8g fiber; 18.2g sugar; 18.5g net carbs; 0.4g protein; 1.4 points.